Mike Kelly, whose autograph after 124 years is worth a king's ransom. He was one of the early superstars, sold to the Boston Beaneaters for a whopping ten grand. 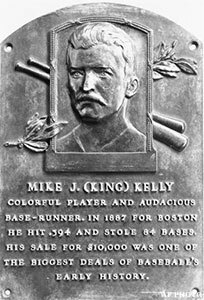 Before there were songs about Joe DiMaggio, Mickey Mantle, and Willie Mays, there was one about the exploits of “King” Kelly. An autographed program from 1887, when cricket still ruled the back pages in the U.S., may fetch $200,000. Read all about it! This entry was posted in Baseball, Cricket and tagged Boston Beaneaters, Joe DiMaggio, Mickey Mantle, Mike "King" Kelly, Willie Mays. Bookmark the permalink.